Recently I finished Water Isaacson’s fantastic biography on Leonardo da Vinci. As an artist myself, I’ve admired Leonardo’s genius level ability to create on his own terms. He basically just did what he wanted, regardless of what his patrons thought or desired. Here’s the scoop…when I travel, I like to read. 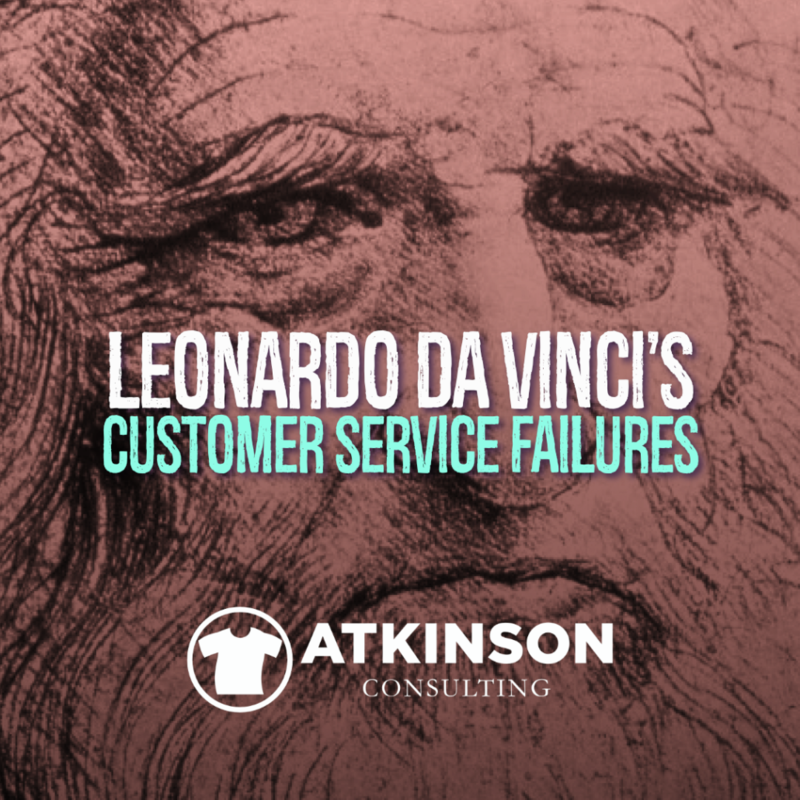 But what got me thinking during the read was that despite his fantastic creative mind and presence in the Italian court, his customer service level was incredibly poor. You’ll see what I mean in a minute. And to make this article more fun, I’ll juxtapose his with the rollercoaster ride in customer service I received with a recent business trip when flying American Airlines. Somewhere in the middle of this will be a takeaway or two you can use, I promise. How’s your level of customer service by the way? I spent last weekend in Dubuque Iowa with my Shirt Lab partner Tom Rauen. We spent three straight days locked in a room planning all four events for 2019. It’s going to be a great year, and I can’t wait for it to get here and help more shops succeed with the excellent sales and marketing training we’ll provide. But, hey…I have to get home sometime. And if you have flown into Dubuque, you know that you need to hit Chicago before you can travel to your final destination. In the air, it’s only a 38-minute short hop. It’s sort of like the colder version of going through Atlanta to get to anywhere in the South. The plane they use for this jump is tiny. I’m 6′ 5″ tall, so it feels like duck-walking down the aisle to get to my usual exit row seat. We’re onboard for about ten minutes and getting ready for the trip to the Windy City to make our connections. I have my da Vinci book out, and I’m learning all about Leonardo’s work dissecting faces of corpses to discover how the lip muscles work so he could engineer Mona Lisa’s famous sfumato smile. You know the one. Meaning their mechanic is AWOL. But still, a chance that we could leave more or less on time existed. I had over three hours to make my connection. It’s late afternoon on a Sunday. The aircraft nose tech can’t be found. Which seemed to mean, you guessed it, everyone has to get off the plane. That’s fine with me. I don’t want to fly on a plane that has a mechanical problem, especially if the guy that is tasked to repair it is downing beer and nachos somewhere watching the Packers game. So we gather all of our worldly travel possessions and shuffle back to the luxuriously appointed Dubuque Iowa gate area to wait for further instructions. This was the last flight out on a Sunday in a tiny two gate airport in the midwest. No restaurants or Starbucks. Everything is closed and buttoned up. It’s just the dozen or so passengers and the four American Airlines employees. This prompts everyone to line up at the podium. Leonardo grew up in a very interesting period. The Italian Renaissance was booming, and fantastic new ideas were everywhere. Remember, during that same era Columbus made his 1492 voyage to discover what would be America, and Guttenberg perfected his printing press in 1440. Not to mention all the fantastic work that other artists, architects, engineers, and scientists made during that time. He was born in 1452 and died in 1519 at the age of sixty-seven. His Mona Lisa is the most famous portrait of all time. The Last Supper disrupted the art world with his creative use of perspective. He created artificial birds, a battlefield tank, devices to drain swamps, gigantic cross-bows, plans for an ideal city, a helicopter, and he even designed pageants and stage settings for performances for royalty. But things didn’t always go his way. He took the commission and accepted the contracts for work that he never completed or delivered. How do you think that would stack up these days? What if you just never got around to finishing an order? Imagine Leonardo in the internet age with social media trolls. For Leonardo, he became the king of not finishing work and started having reputation problems because he didn’t finish what he started. Lots of time to kill, but it wasn’t all bad. The airport crew tried to make us as comfortable as they could. They scrounged up some boxed snacks from somewhere. A big blue bin of chips, cookies, and other treats was walked around as were cases of bottled water. There wasn’t much we could do. I booked the first flight out of Chicago for Monday morning. Boarding starts at 4:28 am. Imagine though the opportunity presented to American Airlines here. It was a mechanical problem. But what if they presented me with some options on what to do to make this better? For instance, in Dubuque, they could have issued me the hotel and meal vouchers that I had to stand in line for when I arrived in Chicago. I had five hours to kill, that would have been a good project to complete. Better, would be to align with a hotel and have the room already booked for me. Imagine how nice it would be to simply know that I had to get off the plane and head to a room to crash for a few hours. What if making me comfortable and happier during this time was a priority? Has anyone observed frustrated and inconvenienced customers in an airport? I wonder if they could change their mind on some of their policies to make their customers happier? Hmmm. What if something out of your control frustrated or inconvenienced one of your clients? What would you do? He was a passionately curious person. On his person at all times was a notebook that he used to make lists for follow up later, sketch people or objects he found interesting, or even jot down a written description of the scene before him. That intense sense of wonder drove his mind to investigate the “why” in what he was observing. That’s correct. Leonardo. The smartest guy in any room in the Renessaince changed his mind often when new facts and data emerged. Today we have a uniquely charged situation where if you “change your mind”, you are a flip-flopper and are seen as someone who is less intelligent. But that didn’t help him with his customer service problem with his patrons. That new plane arrived and the mechanic crew made the decision to not utilize the original plane with the nose issue, whatever that might be. They quickly turned the incoming flight for us and we were on our way. We made our way back and approached O’Hare airport about 10:57 pm. By the time the plane taxied to a gate and we were able to get off it was well past 11:00 pm. By the time I was speaking to a customer service agent, it was closer to midnight. She handed me a voucher for $12 for my inconvenience. Then she asked if I was interested in a hotel voucher or would I prefer to sleep on a cot? Yes. Evidently, this problem is so problematic at O’Hare that they have a section of the airport with hundreds of cots lined up for you to use free of charge. They give you cheap blankets and pillows to use too. While a hotel room would be preferred. I did the math in my head. By the time I left and got to a hotel and went to sleep it probably would be about 1:00 am. The flight boards basically at 4:30 am. Making my way back and to the gate to be on time, I would probably need to wake up around 3:15 or so at the latest. That’s a lot of effort for a two-hour nap. I opted for the cot approach. Oh, so you have something in common with one of the most creative minds in the history of the planet! See, I knew there was a connection. The patron that commissioned The Last Supper, Duke Ludovico, was aggravated at the lack of progress on the work. He complained to Leonardo. Can you imagine being told that? While it wasn’t American Airlines fault, there was a frustrating moment working out my rack space. I find the designated “traveler without a home area” and look around. A lot of cots. Nobody working there. Easily fifty or so people sleeping. It sounds like a chainsaw convention. The cot area is in the middle of a hallway in a completely different gate area. I snoop around and I spy an open door. Inside there are two airport workers talking. The room looks like it is a storage area and is fairly decent sized. I can see a door directly opposite the one I was standing in, about twenty-five feet away. The guy points and makes a motion like I have to circle around to the other side. I say, “Thank You” and start trudging over there. I get to the other side and the guy is there with his helper. Despite the fact that he was less than 10 feet away inside of the room from the stash of pillows and blankets, the guy made me walk around and down a few hallways to get to the door that I saw on the other side of the room. He couldn’t just hand me what I needed when I was there. That’s why your flight always pulls up to the last gate at the terminal, and your connection is the furthest away. I set my alarm on my phone and tried to get comfy. Evidently, it worked, as in seemingly no time it was time to get up. But hey, I got probably an extra hour of sleep. I schlep out to the gate where my new crack of dawn flight will be taking off. I have a $12 voucher that is burning a blistering hole in my pocket. A Venti bold black is ordered and tell the barista to buy whoever is behind me something with the change. Good karma on the way, buddy. With nuclear waste hot coffee in hand, I make it to the gate and wait for my flight to be called. It’s a full flight, as evidence the red-eyed sour-faced crowd is arriving by twos and threes every second, and I find a seat against the wall. Nobody likes to be up this early. The da Vinci book is propped open and as I sip that nectar from the gods, I finish up with the last chapter appropriately named “Conclusion”. In that chapter Walter Isaacson neatly sums up some points about da Vinci that is worth noting. Maybe you are stuck in a creative rut with your art. Does it look the same as everyone else? 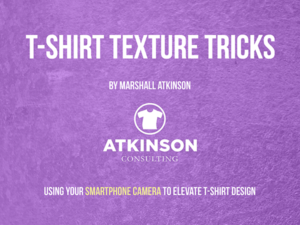 Grab this eBook and learn how to use the camera with your cell phone to capture textures and bring them into Photoshop to instantly improve your designs. I walk you through the process step by step, and you’ll also learn how to separate simulated-process seps into spot colors. You also get tons of textures and photos to use. You won’t even have to stand in line.